Today’s thought is about hope… and the difference between gently nurturing your sense of hope or ignoring it. Not every moment feels as hopeful, or so connected to that sense of gentle momentum. Sometimes you just splat in a heap, stumble about, or inexplicably decide that you are so close to your dreams, you’d better turn back. Not every recovery from a set back will be stupendously elegant, swift or resourceful. We do the best we can at the time: My scale for “best I can” goes from Complete Pants to Stonkingly Awesome. Hope matters because it leads you through fear, it hears your doubts and encourages you to consider that maybe not all of those doubts are completely based in fact. Hope reminds you that new things are likely to feel uncomfortable at first, and the answer to that is not to stop, but to practice, gently. Hope can also be a cheeky monkey and play hide and seek, especially if you haven’t been nurturing yourself and are getting a bit frazzled. But I think one of the ways you can nurture hope is to to treat each moment as a new one. Hope can be nurtured by reminding yourself that the future is not set. The fact that you’ve ballsed something up, again, does not mean you will balls it up for ever more. The past does not equal your future. The past gives you some experience to draw from. End of. What you choose to do right now, with this moment, that’s where you can become hopeful again. Especially if you’re willing to make a tiny change, and see how that works out. Hope is stronger than fear, and with a glimmer of hope – or a socking great truckload of it – you can keep taking little steps forwards. As Thomas Kinkade said, hope is a renewable quality. 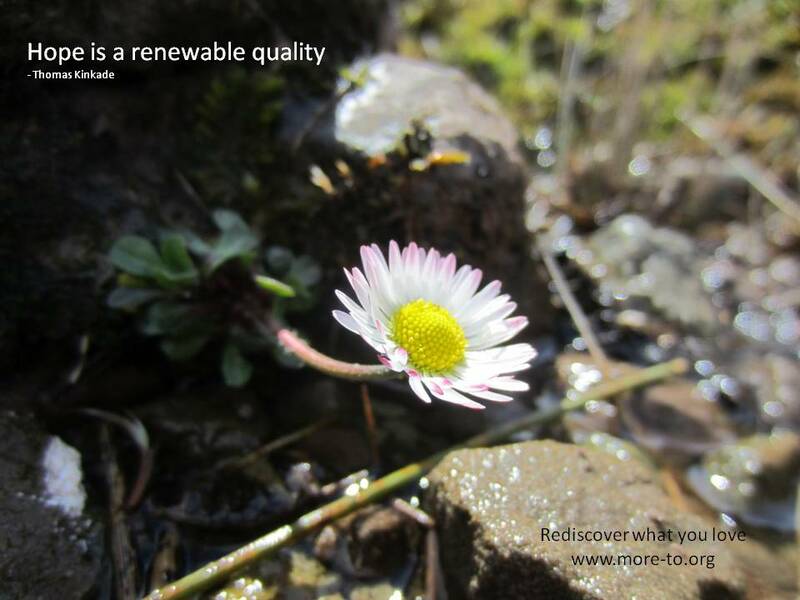 Renewable at New Year, & New Moons, renewable every moment, every breath. Whether you choose to do something differently or circumstances change around you, some kind of newness will happen. This entry was posted in Creating Daily Nurture and tagged Dreams, hope, hope is renewable, moment, new year, Nurture. Bookmark the permalink.